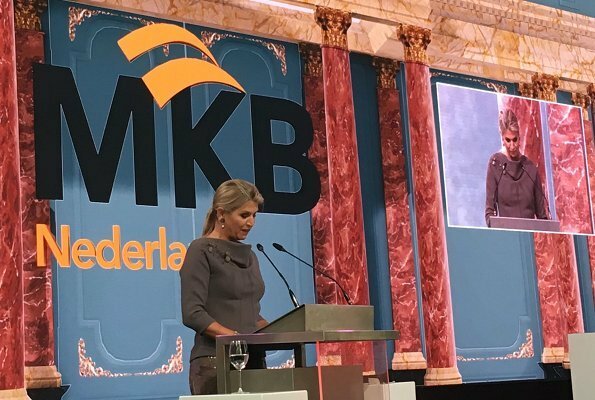 On October 9, Tuesday, Queen Máxima attended the opening of MKB-Nederland (Small and Medium Enterprises - SMEs Netherlands) Congress held at Grote Kerk in the Hague. 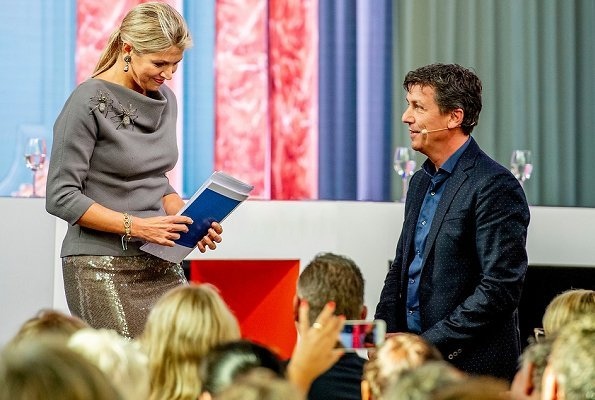 Queen Maxima gave an opening speech at the congress. MKB Annual Congress took place with the attendance of nearly 1000 entrepreneurs from small and medium sized enterprises. 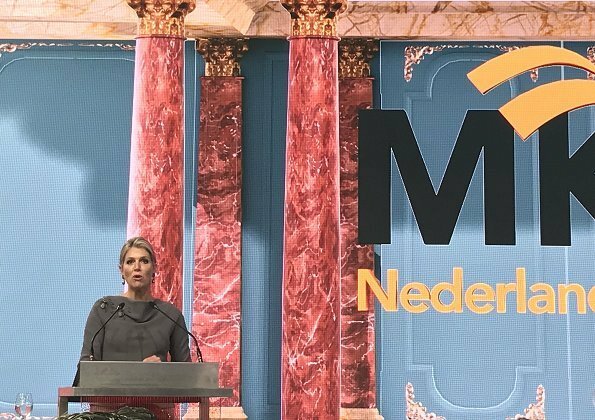 During her speech, Queen Maxima stated the need of the enterpreneurs to renew their businesses and to adapt to the changes in the market. omg are that spiders as brooches on her top? gwah.. I like the shirt with the earrings (not the spiders but that is Maxima), I like the skirt and I like the shoes, but not all together. Perhaps in another light it matches but in my opinion nothing really works. yes ok for everything except the spiders, if that is what they are. Yes some kind fairly large brooches but something softer... I like very much the shirt, would be glad to have it. The shiny skirt and top are ill fitting and don't match at all. Poor choices, but at least she tried to do something to her hair . Nice top don't care too much for the shiny skirt. Her jewely is nice even these mega spiders, also like her hair today. I really like her hair here. I like her top as well, but not with this skirt. I also like the spider pins. Critter pins are not new by any means, and she has placed them well. I expect to be in the minority here, but I really think they are cool. We saw these brooches several times before. So why are people acting shoo surprised. I'm always curious how a lot of the negative followers look like? I am not a very close follower, so the brooches are a surprise. Well Joost, I don't necessarily want to show off, but I get some positive comments on the way I dress, I would have preferred flowers for the brooches f.i., no problem with their size. But if she gets fed up of the shirt, I am a candidate. And I also agree some comments here and there are too negative. Love every piece, especially the spiders! I also love those spiders, as I love all the insect brooches created by Celedonio Lohidoy. And I like Máxima's hair out of her face and nicely styled. Maxima is hier heel mooi gekleed en haar kapsel, eenvoudig bijéén, is prima voor de job. Why oh why does she wear those awful brooches? Not everyone likes spiders, me included. Some people are horrified of spiders. Yet, she wears those things to greet people? She must have a very weird personality. I like her top, but not the shiny skirt with it. Trying not to look at the brooches (fingers over eyes) but I like rest of the outfit on her. And this is a good way to wear her hair, rather than in loose and untidy strings.